That is still par for the course — and a form of shared misery preferred by many Marines. But the procurement system has brought some smart comfort to enhance existing structures, such as these insulating tent liners I watched being installed here. They’re made by HDT for the 100, 200 and 300 series shelters and can bring the temperature inside a tent down a good 15 degrees. Add air conditioning and you practically get a meat locker effect. They look like quilted space blankets and are placed between the tent’s outer and inner liners. Staff Sgt. Israel Maldonado, who installed several liners in a day of dusty hard work with Gunnery Sgt. Marcelino Barajas and any Marines nearby, said he found them by accident. “I had ordered some new tents to replace some of the older ones here, but they sent these,” said Maldonado, who works with the company gunny in Charlie Company, 1st Battalion, 23rd Infantry Regiment, a Reserve battalion headquartered in Houston, Texas. Maldonado is also cutting down on fuel consumption by installing netting with built-in solar panels that bring power into the tents. No doubt all a part of the Marine Corps’ drive to be more “green,” but for one Marine, sleeping behind the liners after a night of patrolling, it was just a nice perk. “Yeah, it’s a lot cooler. I had to get my sleeping bag,” his voice came from the darkness of an insulated tent. I served as an 1161 in the Corps. For those that don’t speak POG, that’s a Refrigeration Technician. 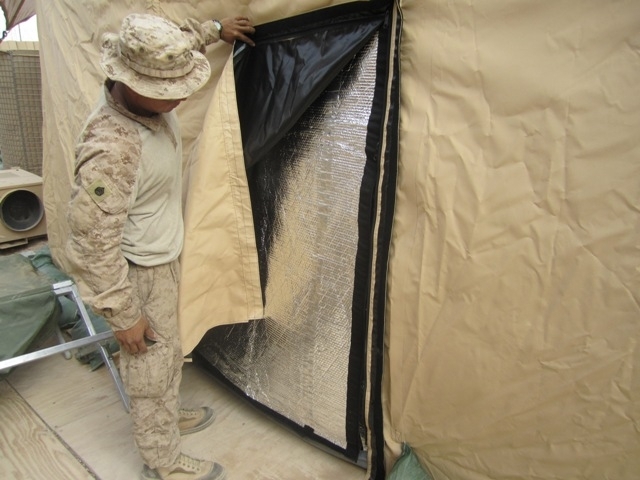 I told my command on countless occasions that we needed a way to insulate our tents that housed all of our communications gear (It would reach temperatures of 90 degrees even with 4 x 36,000 BTU A/C units running). The average household uses 1 x 36000 BTU unit… It’s about time they finally realized how important these liners can be. It helps reduce power consumption, wear and tear on gear and provides a cooler environment for the troops. And EVERYONE loves A/C. Definitely agree on the AC. Back when I was in the Reserves I was a 7242 (DASC) and when we used to take our big fold out shelter to 29 Palms we would always get all kinds of brass visiting. They were all ostensibly there to check in on the DASC and/or their officer friends but we all knew that they were their for the AC.